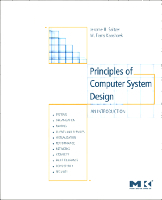 Welcome to the website for Saltzer, Kaashoek: Principles of Computer System Design: An Introduction. A separate instructors site, which requires registration, contains answers to the end-of-chapter exercises and solutions to the problem sets. Click the "Schedule" link to access additional links to readings, lecture notes, assignments, and lecture slides*. *Slides are not available for all lectures. Chapters 7 through 11 are available as PDF documents from the links below. Figures and diagrams from the text are available in EPS, MS PowerPoint (PPT), and Adobe Acrobat (PDF). Links to courses that are using this text will be provided below as they become available. If you would like more information on including your own course in this list, please contact Nate McFadden at n.mcfadden@elsevier.com.